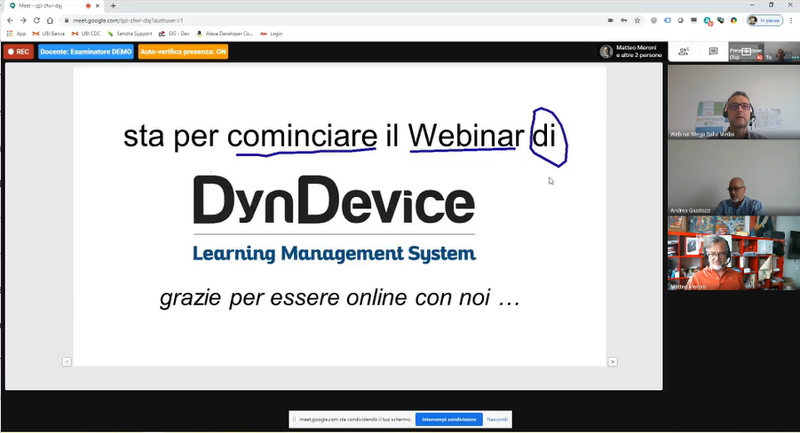 One of the possible modes of virtual classrooms in web-conferencing set up via the DynDevice e-Learning platform is "one to many". In this case, the teacher who starts the lesson can see and hear all the students connected to the virtual classroom (up to 50), while the students can only see and hear the teacher, plus any "projected" slide or the teacher's PC screen when this is shared in the conference. The second available mode is "many to many". Here, the teacher who starts the lesson can see and hear all students connected to the virtual classroom, and they can see and hear the teacher and all other learners, too. This mode, however, can be used with a smaller number of users compared to the previous one: not because of technical limits, but in order to keep the quality of training at a high level. The teacher who starts the web conference will be able to share certain pre-uploaded slides (which are associated to the current virtual session) with all participants. Alternatively, the teacher can share his/her PC screen: e.g. to show and explain how a software works, or show the output generated by Power Point. The third available mode is the creation of a web-conference which is integrated with Cisco WebEx® software. DynDevice will still manage session enrolments, sending of confirmation emails and all relevant documents. At the start of the session, users will be shown a link to download and automatically start WebEx®, thereby enabling them to use it for their web-conference.